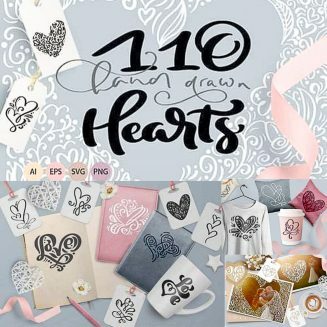 Introducing Valentine hand draw vector bundle hearts which will help you create a cute greeting cards, wonderful wedding invitations, dashboards and stickers, photo & text overlays, divider text and more! It`s includes 110 vector Calligraphy Valentine’s Day heartes for design. All in EPS, AI, SVG and PNG files. File format: .ai, .eps, .png, .svg for Photoshop or other software. Tags: hand drawn illustration, heart, invitation, logo, love, romantic, shape, St.Valentine's day, swirl, Valentine.